As campus recreation professionals—whether we work in aquatics or marketing, facilities or club sports—most of us are first and foremost in the business of developing students and increasing their leadership capacities. This is why leadership has been identified as one of the six strategic values of collegiate recreation. Many professionals and departments are intentionally applying one or more leadership development theories or models into their student-employee training. However, anecdotally, we know that the majority of campuses are not drawing upon a specific model or framework in the leadership development of their student staff. As collegiate recreation professionals we are fortunate to work side-by-side with individuals who come from a variety of advanced degrees. The professionals who make up campus recreation departments across North America specialize in an array of areas from sport management to exercise physiology, recreation leadership to public health administration, higher education to business management. This diversity within our profession often creates a rich and dynamic atmosphere that embraces discussion from multiple angles and viewpoints. This atmosphere is one of the unique qualities that affords collegiate recreation such a valuable platform to provide leadership opportunities for the students we serve and employ. However, we also should acknowledge that often those advanced degrees may not require classes that specifically address leadership development theory. Consequently, it is our responsibility as professionals in this field to continuously educate ourselves so that we can effectively navigate and report our successes in student development using the language that resonates in a higher education context. In June of 2012, the NIRSA Board of Directors constituted a Leadership Commission. The Board charged this commission with researching and analyzing what it takes to be a leader today, identifying the developmental opportunities necessary to become an effective leader, and developing a way to assess the stages of leadership and evaluate the progression of emerging leaders in the field of collegiate recreation. Student Leadership Development through Recreation and Athletics. Initially co-chaired by Dr. Don Stenta of the Ohio State University and Dr. Cara McFadden of Elon University, the work of the Commission resulted in the creation of a sourcebook entitled Student Leadership Development through Recreation and Athletics. This sourcebook was designed to engage higher education professionals with concrete competencies that will enhance their understanding of how students’ leadership capacity is developed in recreation and athletic environments. This sourcebook is a part of the New Directions for Student Leadership (NDSL) series from Wiley Books. 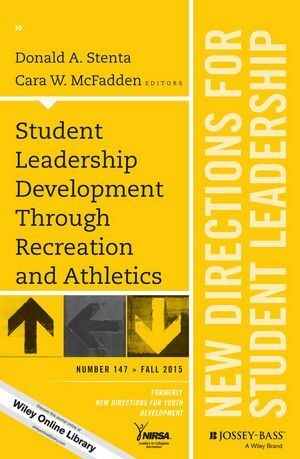 “To create intentional leadership programs in collegiate recreation environments,” explains Dr. Cara McFadden, “professionals must understand the importance of aligning leadership programs with where students are developmentally. This sourcebook is a resource designed to assist professionals with language and strategies to create programs to develop leadership capacity in students.” A complimentary copy of the sourcebook was sent to all NIRSA member institutions in the fall of 2015, and individual NIRSA members were notified that they could obtain copies at a 25% discount. Yet, in speaking with our colleagues across North America at the 2016 NIRSA Annual Conference & Recreational Sports Exposition, it became increasingly clear that many were unaware that this resource existed. Currently, the NIRSA Leadership Commission is charged with creating resources that—when coupled with the sourcebook—enhance member institutions’ intentional leadership development practices. To guide the efforts of the Commission, we invited NIRSA member institutions to provide feedback about their current practices. The data will help shape the development of the next generation of resources for collegiate recreation practitioners. In April 2016, a survey was sent to the institutional member contacts—a majority of whom are department directors—at all NIRSA member institutions. Seventy individuals took the time to weigh-in. The following provides an overview of the key findings. The results of the survey revealed that we as a profession need to become more intentional in creating and assessing the opportunities we provide our students within the area of leadership development. It is up to us—the practitioners in the field—to showcase, within the framework of higher education, how collegiate recreation makes an impact and influences the development of students’ leadership efficacy and capacity. We must also highlight the important role we play in developing students into active and engaged leaders within their communities. What can you do to become more intentional? If you can relate to the majority of our survey respondents who said they “provide leadership development for student staff, yet do not incorporate any specific leadership model or framework,” one of the first steps you can take toward becoming more intentional in your leadership development of student staff is to read Student Leadership Development through Recreation and Athletics. Already using an effective leadership model or theory? If you feel that your department has a leadership development program that is utilizing the framework of student development theory and would like to be considered for a best practices feature, please contact Mila Padgett. Mila Padgett is currently the Director of Campus Recreation & Wellness at the University of South Carolina Aiken. Melissa Longino is currently the Director of Campus Recreation at the University of Dayton.